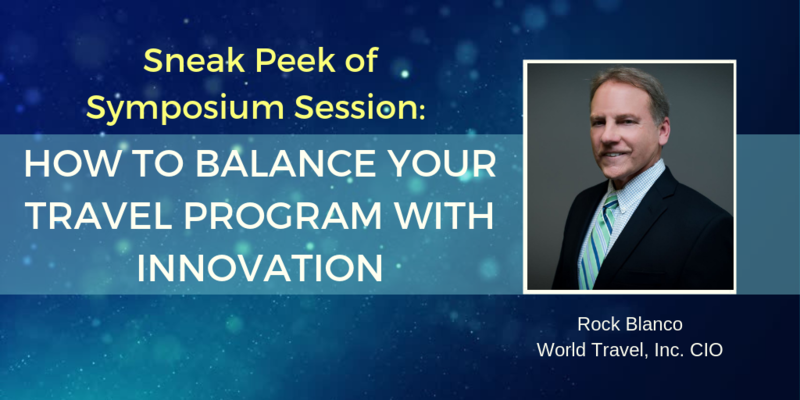 With World Travel, Inc.’s Fall Symposium 2018 only days away, we’d like to give you a behind-the-curtain look at one of the main sessions, featuring our very own Chief Innovation Officer, Rock Blanco. We checked in with Rock to hear how his recent appointment at World Travel, Inc. is going so far and what he can tell us about the innovative plans he will unveil at Symposium. Rock also offered his advice for travel managers looking to better incorporate technology into their travel programs. Read on for a sneak peek! To hear Rock’s full presentation, register for Fall Symposium 2018 here. Q: It’s been just over 4 months since World Travel, Inc. announced your appointment and the development of the Innovation Center. How’s it going so far? A: It’s been a tremendous experience so far both from a personal and professional standpoint. I’ve had the chance to meet so many talented and welcoming colleagues here at World Travel as well as many of our clients. From an innovation standpoint, it’s going well because you want to ensure your overall product strategy screams value and relevance as much as ROI. So far, the initiatives that we have in development align precisely with what our clients have indicated are on their wish list. Q: What can you tell us about what the center has been working on? Or in other words, what have you and your team been cooking up in the lab? Communications – being able to facilitate the best means of communication between World Travel resources and our clients. That means incorporating chat and messaging platforms for accessing, communicating, and interacting with our staff, our products, and our resources. Content – Providing secure 24/7 access to a library of travel resources that is device agnostic and allows those responsible for managing their corporate travel program to facilitate what content is made available to their travelers from desktop to tablet to mobile device. Convenience – We’re at a crossroads now where what we view as “the norm” is validated by “generation.” We’re not here to challenge the “norm,” but rather to integrate “compelling” technology including chatbots and voice response products like Amazon’s Alexa into our product portfolio. Imagine being able to send a simple SMS text message to get your travel reports or ask Alexa if you have any travelers in high risk locations. We’re planning to extend the accessibility to those products and services that are used most to maximize convenience and flexibility for our clients. Q: World Travel, Inc.’s Fall Symposium is coming up very quickly. In fact, it’s only days away! On the agenda, it is listed that you will be speaking about balancing innovation with running a successful program. Can you give us a teaser on what you will be discussing? A: The pace at which innovation is driving change in our world is beyond our control. Every aspect of the corporate travel program is going to change whether we buy in or not. With some “show and tell,” I will speak to how our innovation strategy for creating new products around future trending technology, balanced with re-inventing existing products that our clients depend on to do their jobs, to deliver that balance on a consistent basis. Q: How important is utilizing technology for operating and managing a successful travel program? A: Booking travel has never been easier, but being able to manage those bookings, account for the safety and security of travelers when those bookings originate outside the travel program, and truly be able to validate the ROI around a travel program is impossible without the right balance of products and services. The main takeaway here is that technology doesn’t exist to replace travel managers and automate business travel in a whole new way. It’s about empowering all of us with tools that help reduce risk and stress for corporate travelers. Utilizing technology will bring faster and more efficient solutions, freeing time for better strategic and analytical decisions. Q: What new technology should corporate clients be paying attention to? A: Less about the tech and more about the who. The advances being made in airport security screening like eye and fingerprint scans which will be the fastest way to get to the front of the security line going forward. The continued impetus around New Distribution Capability (NDC) and the impact this will have on air booking options, pricing, and certainly a dose of complexity. Continued intrigue around incentivized behavioral travel products like Rocketrip and others. Continued advancements by Google and Amazon for their personal assistant products and, dare I broach this topic, but watch out and see how cryptocurrency makes its way into our industry as a travel payment option. Q: How can a company best incorporate a travel technology solution into their program? A: First, list the problems that you are trying to solve. Next, identify the features that you feel are “must haves.” Then, define your requirements and the individual roles of those who will use the product. Do your best to understand any limitations that will impact utilization around the product or platform because of data availability, security, and privacy. And finally, do the smart thing and contact World Travel. Who knows? We might already have a solution in place. Want to hear more? Check out Rock’s full presentation at World Travel, Inc.’s Fall Symposium 2018!